Internet is rife today for convenience- to shop, manage bank accounts, billing, booking travel tickets, hotel, to connect with friends and lots of other things. It is a bang in the millennium which broods more industry leaders to become the prominent part of this competitive rage. To be vigilant and prolific, a business needs to have an online presence which enhances their dignity on the World Wide Web. Internet savvy exists worldwide, making it a rich and powerful medium for any business to use. The very first step to build an online influence is to select a right domain name that resembles with your business. It is a good practice to find an ICANN (International Corporation for Assigned Names and Numbers) accredited company for domain name registration so that customers can easily find out you via internet. And once you have registered your domain name, you can leverage it in various ways, such as building your website or uplifting your branding through business class emails. While you are searching a domain name, select it carefully as it reflects your business and brand identity. Some top level domains such as .com, .org, .net, .biz etc., offers instant visibility and credibility for your business. Such kind of domains is appropriate for varied size of businesses. Your domain name is your identity on the internet and it needs the utmost protection. Similar to a bank account, you need to manage it carefully. You need to focus upon the brand building strategy, along with all the time, effort and resources you need to leverage the performance. - You should have the complete privilege over your domain name and the information associated with it. - Update your domain name details through 'Manage Domain’ section that you can find in the domain control panel. - Keep in mind to provide accurate contact information while registering a domain name. In a nutshell, to remain competitive in today's internet reliant world, it is necessary to have every bit and byte of information in your mind while registering your domain name. Choose affordable web hosting services to unveil your identity on the internet. 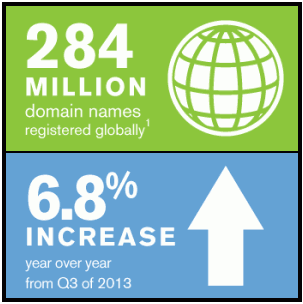 According to the third quarter of 2014, there is a figure of 284 million domain name registrations across all top-level domains (TLDs).